Cnc Lathe Machines An Epitome Of Excellence - Trishtha Industries Pvt. Ltd.
CNC Lathe Machines – an Epitome of Excellence! The CNC (computer numeric controlled) lathe machine is described as the mother of all metal shaping processes. This machine has the capability of taking metal shaping to the next level by automating the entire process, leading to reduced human supervision and enhanced output of the machine. 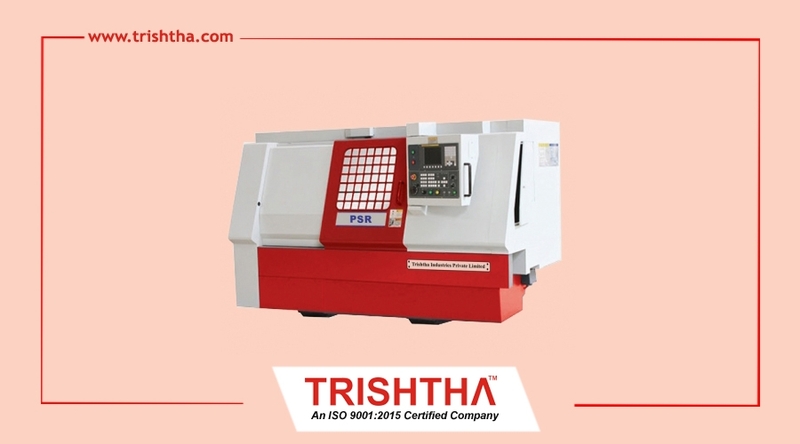 Trishtha, one of the foremost CNC lathe machine manufacturers in Kolkata, specifically designs and develops CNC lathe in order to maximize efficiency and productivity in order to make sure better profitability. Since we make use of cutting-edge technology to produce CNC lathe machines, our machines eliminate downtime. Our latest CNC lathe machines have successfully replaced the traditional one as it is better in terms of precision, accuracy of machining, ease of operation and repeatability. The equipment makes use of latest tooling techniques and guarantee maximum production. Moreover, our machines are completely enclosed during operation and that makes sure that safety of the operator. As one of the top-notch CNC lathe machine suppliers in Kolkata, we employ the very best in technology to produce high-end CNC lathe machines. Our machines are available at affordable rates thanks to operating systems like, Linux and such other open source CNC software. We bring to you a range of dual spindle lathe machines that allows for multiple operations to take place simultaneously. When talking about epitome of excellence in the machining industry, very few equipment come close to the CNC lathe machine. If you are looking for CNC lathe machine manufacturers in Kolkata, do check us out. We are confident that we will not disappoint you. Our team of expert and friendly professionals will answer any question that you might have. So, get in touch with any hesitation.